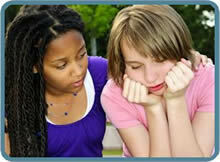 Home » Your Questions: Teens » Do teens suffer more pain with abortions? Yes. Research finds they do, both physically and emotionally. Teens are more likely to have riskier late-term abortions. According to the CDC, approximately 30% of abortions among teens take place at 13 weeks gestation or greater, compared to only 12% among women in general. Late-term abortions are associated with more severe psychological complications, a higher risk of serious physical complications, and trouble in later pregnancies for mother and baby. What is the connection between abortion and the the increased risk of Breast Cancer?